UBX-M8230-CT GNSS receiver chip. Photo source: u-blox. 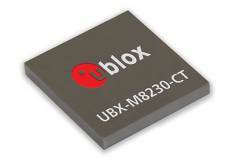 Thalwil, Switzerland-based u-blox has announced the launch of its new UBX-M8230-CT GNSS receiver chip, designed to offer a unique balance of performance and ultra-low power use. The new Super-Efficient (Super-E) mode cuts the power consumption by two-thirds to a mere 20 milliwatts at one position update every second with hardly any loss in accuracy, according to the company. It delivers continued superb speed and position accuracy even when tested in applications such as wearables and portable electronics, where the antenna is small and movement prevents a constant view of the sky. The UBX-M8230-CT’s Super-E mode is well-suited for devices that require high levels of speed and position accuracy, but where power is limited. Along with smartwatches, sports wearables and fitness trackers, it can be used in trackers for assets, people, children and animals, to provide accurate and frequent location information with minimal impact on battery life. "Constantly needing to know the user location in wearables has a strong strain on the battery, which has traditionally limited GNSS adoption. UBX-M8230-CT’s low power consumption combined with its high positioning accuracy and the ultra-small design footprint of less than 30 mm2 makes it possible to add GNSS to virtually all wearables," said Florian Bousquet, market development manager, product center positioning at u-blox. He added: "The UBX-M8230-CT’s Super-E mode uses concurrent reception of GPS with either GLONASS or BeiDou. It allows batching location data temporarily on the chip, which helps to further reduce the system power consumption by avoiding the need to constantly run the main CPU." The GNSS receiver chip optimizes the overall system power consumption by excluding the need for any heavy signal processing on the application processor, and with external components, such as external LNA, that can be automatically duty cycled. Navigation data can be stored internally while the application processor is in deep sleep (data batching). Used in the combination with multi-GNSS Assistance data, the UBX-M8230-CT not only features faster Time-to-First-Fix, but also ensures minimal power consumption, since A-GNSS enables the chip to maximize its power optimized period, according to the company. The UBX-M8230-CT is built on the u-blox M8 concurrent engine and supports two constellations simultaneously in Super-E mode, thus increasing the number of visible satellites compared to single-GNSS solutions. It also is designed to support message integrity protection, anti-jamming, and anti-spoofing, to provide reliable positioning in difficult environmental conditions as well as in security attack scenarios. The UBX-M8230-CT only needs a few external components (e.g. SAW/LNA) to form a full GNSS solution with a footprint as small as 30 mm2. It offers easy access to navigation data via multiple interfaces, such as SPI, I2C and UART. Optimized for portable and wrist-worn applications, it provides an excellent level of positioning performance for such devices. The UBX-M8230-CT chip is an ideal choice for most wearable applications, such as watches, sport trackers and other applications where low power consumption and small size are key. The UBX-M8230-CT is built on the u-blox M8 concurrent engine and supports two constellations simultaneously in Super-E mode, thus increasing the number of visible satellites compared to single-GNSS solutions. It also supports message integrity protection, anti-jamming, and anti-spoofing, providing reliable positioning in difficult environmental conditions as well as in security attack scenarios. To learn more about UBX-M8230-CT and see a live demo, visit u-blox in the meeting room 2C3MR at the Mobile World Congress in Barcelona, February 27 to March 2. Samples will be available in March 2017 and volume production will start in summer 2017.